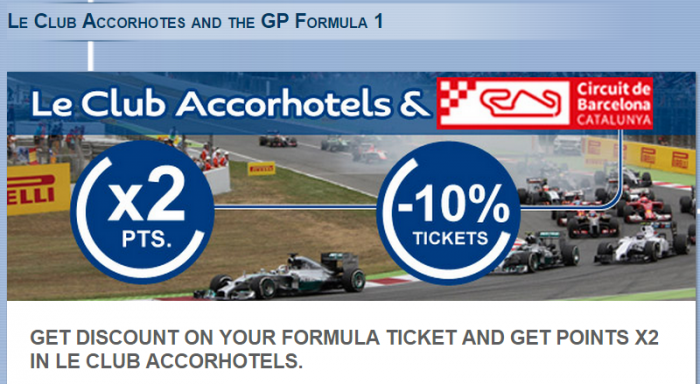 Le Club Accorhotels has launched a double points offer for stays in Barcelona during the Formula 1 championship. The promotion is valid for stays between April 13 – May 13, 2015, that are booked between March 13 and April 30. Registration is required. There is no other requirement than to book any other than Le Club Accorhotels points qualifying rate to take advantage of this. This reminds me of my last trip to Barcelona the other year that happened to concur at the same time with this Formula 1 race that I was not aware of. All the hotel rates were insane, but was able to find something tolerable at the Ritz-Carlton affiliated hotel in the city. Seems that this promotion is a month long and the T&C’s are unclear if you can take advantage of it more than one time. 1.General Le Club Accorhotels terms and conditions apply to the Formula 1 GP offer. 2.This offer is valid for bookings made between 13/04/2015 and 13/05/2015 at one of the participating Accor hotels and booked between 13/03/2015 and 30/04/2015. 4. This offer entitles members of Le Club Accorhotels program, regardless of their status, to benefit from obtaining bonus points X2 in one of the Accor hotels involved in the offer. The number of bonus points for this offer is calculated according to the points earned by the member based onstatus “Classic”. 5. You must book your stay in advance to take advantage of this offer at www.accorhotels.com or websites of participating hotels, or through the Accor reservation center. 6. You must provide your loyalty card or membership number when booking and present your card at the hotel reception when you check in for your stay. 7. Le Club Accorhotels points are credited to the member’s account within 10 days of the end of your stay. 8. Reservations that include several rooms covered by the same member during your stay are only counted as one stay. 9. This offer can not be combined with other offers or current advantages and does not apply to groups. 10. This offer is subject to availability. The terms and conditions of sale apply to public rates specific to each hotel reserved. 11. The discount on tickets Formula 1 Grand Prix will be for a maximum of 4 tickets per transaction and Le Club Accorhotel member. 12. The Circuit deBarcelona reserves the right to check the number of Le Club Accorhotels member when check in to the circuit. 13. Any issue happened in the purchase of tickets in the Circuit de Barcelona Catalunyalink, must be solved directly with the Circuit de Barcelona Catalunyacall center.